Peter Enman of Brewer reflects during a pause in the Bangor-Brewer Veterans Day Parade, Nov. 12, 2017. It’s important to recognize Veterans Day is set aside for the people among us — our friends, neighbors and family members — who have served. Maine has a penchant for service. 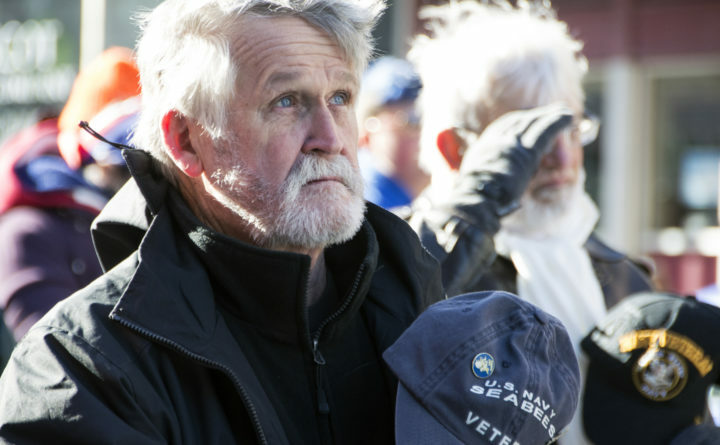 Maine is among the top four states for the percentage of veterans in the population. In 2016, according to the U.S. Department of Veterans Affairs, nearly 120,000 people living in Maine, about 10 percent of the state’s population, had served in the military. Congress voted for Armistice Day as a legal holiday in 1938, 20 years after the first armistice ended the carnage of World War I on Nov. 11, 1918. Although World War I was originally called the “war to end all wars,” by the late 1930s few believed that hope could still be kept alive. Storm clouds were building in Europe, and on Sept. 1, 1939, World War II began when Adolf Hitler’s troops invaded Poland. In 1953, the people of Emporia, Kansas, began calling the holiday Veterans Day as a tribute to the veterans of their town. Soon after, Congress passed a bill introduced by a Kansas congressman renaming the national holiday Veterans Day. The name will remain as long as there are caring people to remember its significance every Nov. 11. The 11th hour of the 11th day of the 11th month is set aside each year in solemn remembrance of the first Armistice Day, when the world rejoiced and celebrated after four years of unspeakable horror, and to remember the sacrifices men and women made in order to ensure a peace that would last for many years. That remembrance takes on added significance this year, the 100th anniversary of the armistice that ended World War I. Over the years, the way Americans celebrated Veterans Day shifted from solely honoring the dead to honoring veterans of all wars. Especially after the nation’s long involvement in the Vietnam War, the holiday’s emphasis was broadened to include not only parades and patriotic orations in village squares but also gatherings at major landmarks such as the Vietnam Veterans Memorial in Washington, where people walk silently along the wall, placing gifts and standing in quiet vigil. Often their hands fall over the names of those who made the supreme sacrifice in an unpopular war never officially declared by Congress. As Americans remember their military veterans — those who served in times of war and peace — it should be with some degree of shame at how poorly the nation has cared for its aging warriors and those who recently returned from combat zones. The Veterans Administration health care system will be stressed in coming years as baby boomer vets approach senior citizen age. And the needs of veterans who have experienced conflict in Iraq and Afghanistan will continue to be felt. The unacceptably high rate of suicides in returning soldiers and the increasingly visible scars known as post-traumatic stress disorder remind us that much more must be done to help these men and women cope with the mental strains of their service. Early diagnosis and treatment — a principle that yields results in all sectors of health care — ought to be the goal of care for veterans as well, especially for those bearing the psychological wounds of war, because it will ultimately save the public money, and it is the right thing to do. This Veterans Day, please take a few minutes to thank a member of your family or a neighbor who served or is serving this country. Remember that America’s veterans are common Americans of uncommon valor and devotion to duty. This day belongs to these gallant Americans.